We have a fantastic range of seasonal bouquets currently in stores for Mother’s Day this Sunday. 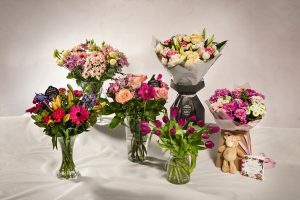 Ranging from the Mother’s Day bouquet gifting box, complete with a teddy and card to our finest* Gifting Rose Splendour Bouquet which showcases premium roses and lilies and market leading freshness and quality. Priced between just €2.50 and €39.99 our mother’s day flowers have something for everyone, no matter what your budget is. Don’t forget to use your privledgecard for 10% off!